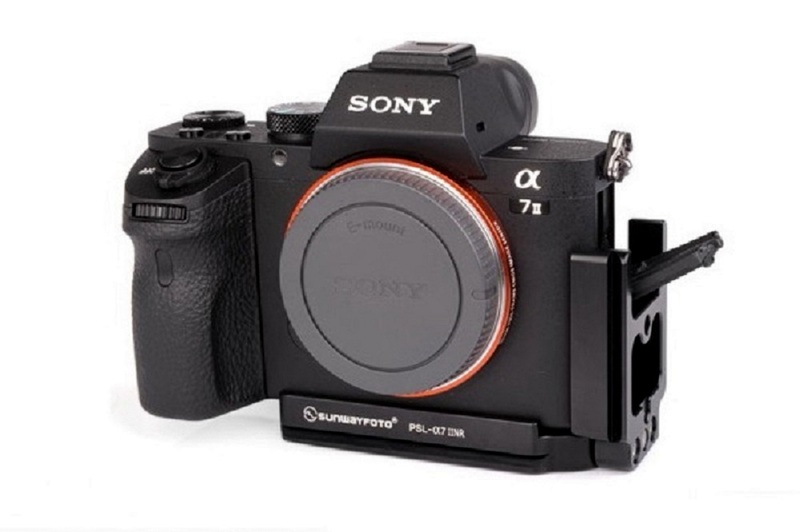 Sunwfayfoto has recently released a a custom Arca-Swiss® compatible L Bracket dedicated to the second version of SONY's high end full frame mirrorless camera the α7 II. 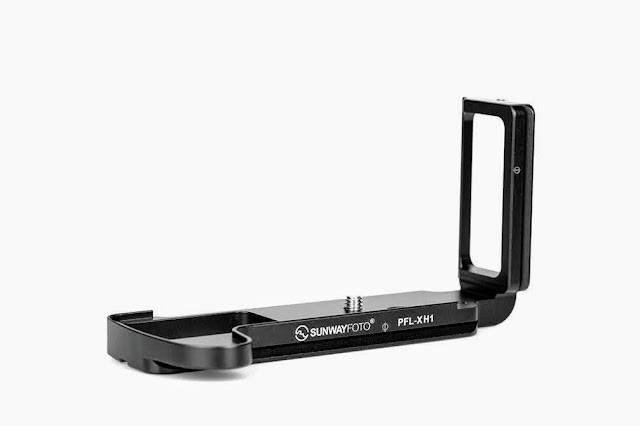 That was Sunwayfoto's Mk II version of their L bracket which was intended for the former α7 and α7R cameras. Therefore care should be taken as this model name similarity is quite misleading. However, Sunwayfoto had introduced their mark II L bracket for the α7 quite before the newer SONY model α7 Mark II was introduced. 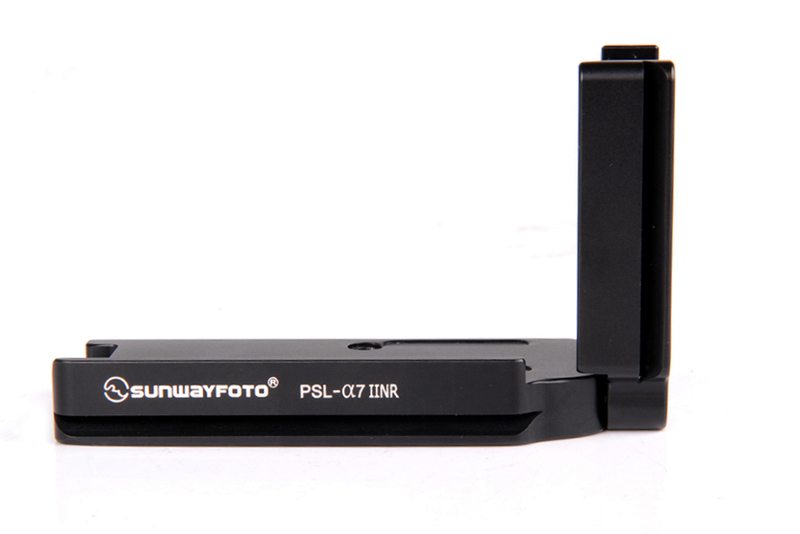 Sunwayfoto PSL-a7IINR Arca-Swiss® compatible custom modular L bracket besides the high standard CNC machined Aluminium structure is designed after the latest Sunwayfoto trends, including hard coat anodizing and a dovetail width that is compatible even with RRS® lever release clamps as the "R" denotes at the end of the model name. One convex ridge on the front of the base plate and one on the front of the vertical side plate act as stoppers and prevent the L bracket from twisting. The new long base-plate dovetail design allows quite a lot more lateral adjustment compared to previous Sunwayfoto models for the Sony cameras. Another attribute of the PSL-a7IINR is that the base plate and vertical side plate dovetails are aligned following the example of the previous model. As said then, this fact combined with center Φ marks on both plains proves very effective when changing orientations since no correction in framing will be needed at all. 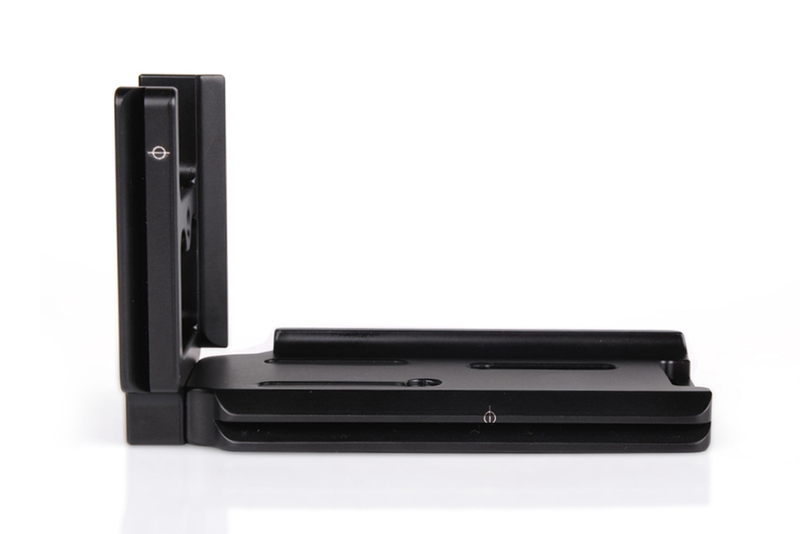 The modular PSL-a7IINR L bracket comes in two parts, the base plate and the vertical L side, which is attached on the base plate via two M4 hex screws. The L side can be easily attached / detached by the user utilizing one the included Allen hex keys, if saving some weight or bulk is critical. The vertical side plate has an unusual shape with a mid brace and an open U on top in order to conform with the α7II side connector cover, which flips downwards instead of on the side as we are accustomed to. This design however, allows for only one M3 safety stop screw on this plain but permits for one more 1/4"-20 threaded hole for mounting on a pod. The base plate is mounted on the camera via one 1/4"-20 hex-socket (but also slotted) captive mounting screw which resides in a quite long captive slot, allowing for the L bracket to be moved away from the camera side. There are also two M3 safety stop screws at both ends and an 1/4"-20 threaded hole for mounting on a pod without removing the bracket. Further, it offers an strap loop on the base end for the attachment of a wrist strap. All appropriately sized Allen hex keys for the mounting, stop and side screws are supplied. The PSL-a7IINR L Bracket fits nicely and embraces the Sony α7II body adding about 1 cm to the camera dimensions and very little weight. The PS-a7IINR base plate occupies all the width under the LCD screen, starting from the left edge and stopping just before the battery-door hing enabling the unobstructed exchange of batteries.The vertical L side differs quite a lot from other models in shape and size since it reaches lower than usual. As shown above, the vertical plate "U" opening permits full access to the camera side connectors with their covers flipping open downwards. Both the vertical and horizontal anti-twisting convex ridges sit against the front panel of the camera. In this manner nothing interferes with either the raising or tilting of the LCD screen. 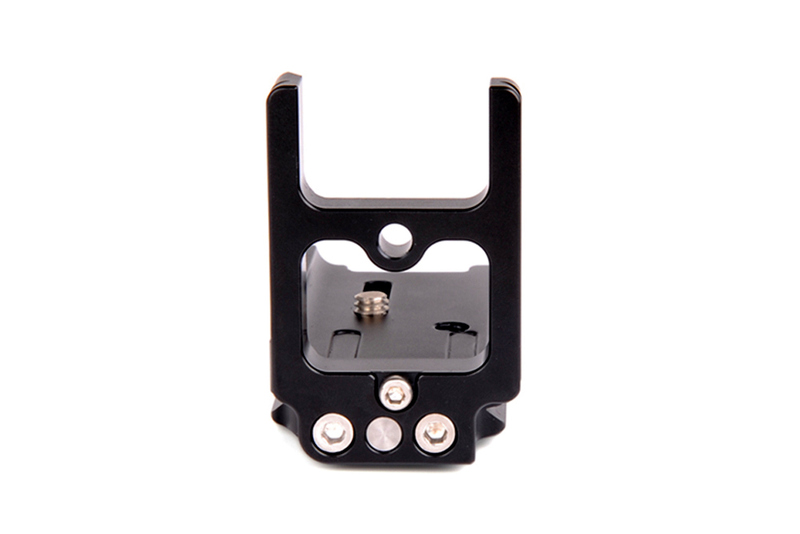 Besides the purpose of getting an L bracket in order to be able to clamp a camera in landscape and portrait orientation remaining on top of the tripod head, as illustrated above; the PSL-a7IINR features a mounting screw that can move within the limits of a captive slot on the base plate. 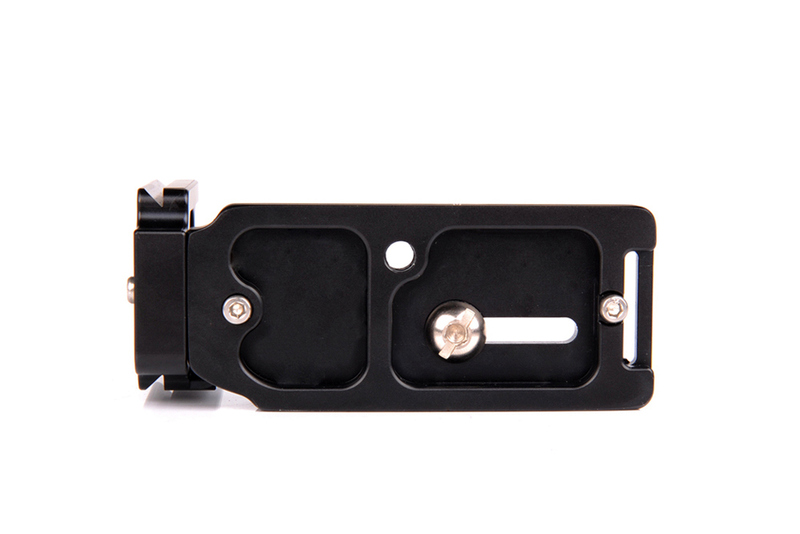 This allows sliding the vertical plate away from the camera side in case large connector jacks are used for e.g. tethered shooting, enabling the user to clamp the camera in portrait (vertical) orientation. 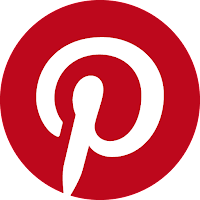 Current price for the PSL-a7IINR L Bracket is US$ 49.95 and is only available from eBay.